Textures are flat images used by the Pattern Brush tool and some options under the Projection tool. They are also used by the TextArt engine. They are implemented as layers with the excluded option and TILE metadata with "Texture" intent. Because textures are layers, they are always preserved in a saved image, and can be assumed persistent. The presence of a texture is indicated by a status icon and the presence of the "current texture" gadget. See the sections on the Pattern Brush, the Projection tools and the TextArt engine for information on how to use texture objects in your drawings. To install brushes, you need to copy the CD5 files to the Textures folder in your Chasys Draw IES resources folder. You can find this folder by selecting Open Repository from the Objects menu. To creating a texture is easy – just draw/load/create any seamlessly repeatable image, then save it in the Textures folder. If you want to have multiple textures in the same file, use the image-list image-mode. You can also create a texture for immediate use from any non-background layer in your image using the Initialize Layer option under the Objects/Textures menu. 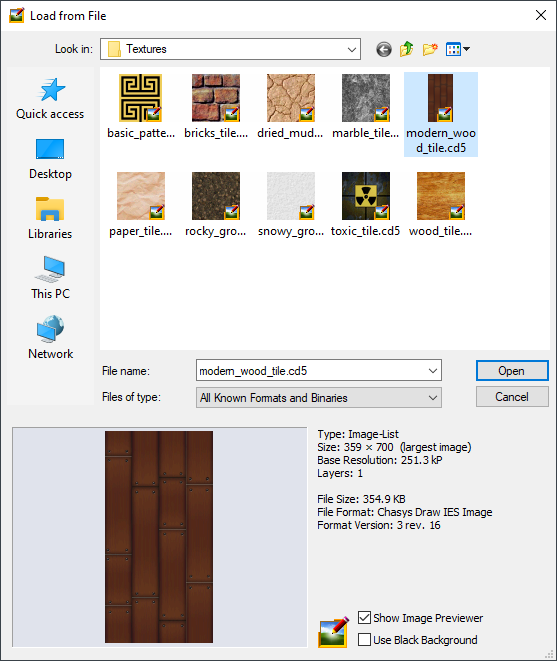 Texture objects can be saved to file, which are then stored in the textures folder. Chasys Draw IES comes with a number of predefined textures, but you can always add your own.